Where are all the grandparents in contemporary fiction? Can creative writing be taught? Why remember Shoulder to Shoulder? Should we prize literary prizes? Human rights plan will please eurosceptics but what’s in it for the rest of us? Does the jury system work? ‘Cash for access’ scandal: What impact will Miliband’s proposals have on MPs and the public? What the **** is linguistics? Who can control the post-superpower capitalist world order? Today is happiness day, but could greater happiness be a permanent reality? Lobbying: why is it so difficult to reform? This post was contributed by Dr Becky Briant, from Birkbeck’s Department of Geography, Environment and Development Studies. When I set up the MSc in Climate Change Management at Birkbeck in 2009, I thought I knew about climate change, having studied it since I was an undergraduate student in Cambridge. What I wasn’t prepared for was how little I actually did know. I didn’t know how much change had already happened (particularly in the Arctic and high mountain regions), and I didn’t realise just how little time we have left to make the sort of changes in our carbon emissions that our societies will be able to adjust to relatively easily. So, it was fascinating to watch a similar journey of discovery played out in the Birkbeck Cinema in Gordon Square last Thursday. The Department of Geography, Environment and Development Studies (GEDS) organised a screening of the new film Thin Ice for UN World Environment Day. This film follows the geologist and amateur filmmaker Simon Lamb on a voyage of discovery to find out how reliable the science around human-induced climate change is. As a geologist, you might think that he too ‘knew’ about climate change, yet the film showed that there was so much more to know. Footage followed scientists in their ‘daily lives’, collecting data and analysing it, including shadowing scientists at the New Zealand Scott Antarctic Base. It looked at daily climate measurements and how atmospheric chemistry (including carbon dioxide) is measured at the present day. He also talked to physicists who explained the greenhouse effect and modellers about how robust their models are. What I found most fascinating however, was his interview with Phil Jones of the Climate Research Unit (CRU) at the University of East Anglia. The interview was recorded before the events of ‘Climategate’ and to me clearly showed what the independent review later stated, that the CRU undertakes robust research on instrumental temperature records, and that the trend shows the temperatures are clearly increasing, as shown below. This trend is clearly seen also in many other instrumental temperature datasets. 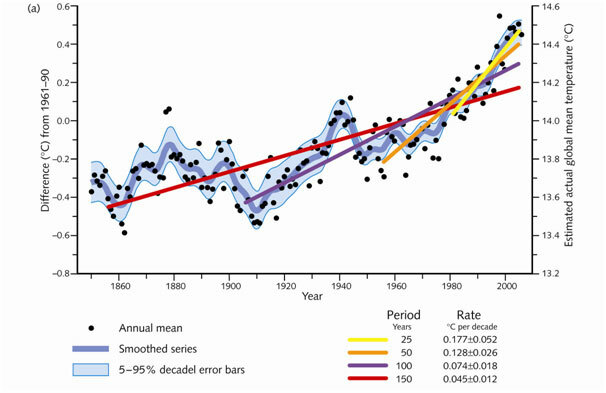 Graph shows globally averaged Earth surface temperature (combined land and sea) based on instrumental datasets and produced by the Met Office’s Hadley Centre and the CRU in Norwich for 1850-2006. Source: Houghton (2009) Figure 4.1a based on FAQ3.1, Figure 1 of the Intergovernmental Panel on Climate Change Fourth Assessment Report from Working Group 1 (2007). Following the film showing, there was a spirited discussion between ‘Thin Ice’ filmmaker David Sington, Antarctic scientist Colin Summerhayes and me (Dr Becky Briant) about how this problem can be tackled. The science is clear, despite vocal sceptics working hard to hijack the debate, but the politics are much more complex. This seems to be particularly since the pace of change is slow enough, at least in temperate regions, that urgent action seems like it can be put off. Debate was particularly lively around Colin’s assertion that scientists might come across as too alarmist to try and counter the sceptics and harm our own case. This was not a popular position and I was particularly struck by a student on one of the GEDS undergraduate programmes who is from Peru where she stated that mountain glaciers are melting, water supplies are threatened and no-one doubts the reality of human-induced climate change. Overall, much food for thought, and continued discussion over drinks outside the cinema. Category: Social Sciences History and Philosophy Tags: climate change, environment, film-screening, science by Bryony. Birkbeck academics are actively researching in areas relevant to a wide range of issues in our society. Here, they offer their comments on the issues and events of today. If you’re on Twitter use the hashtag #BirkbeckComments to join the discussion! Birkbeck students launch Mammalo – the new “Uber” for on-demand services.